Rich in vital trace minerals and complex nourishment, the sea is our source of life and equilibrium. Phytomer, meaning plant of the sea, combines marine extracts from oceanic plant life to create long term results for those that are seeking true solutions to well being. For over 35 years, by following a philosophy of thalassotherapy or seawater therapy, Phytomer has utilized this rich marine source to recreate the art of marine healing in order to restore balance and beauty through innovative skin and body treatments. All professional treatments have been enhanced with the inclusion of the Reflexothermale Method, which targets reflexology zones to optimize relaxation and positive results. This multi-purpose gel has an ultra-soft airy feel with endless possibilities, such as blending with foundation, applying under cream, blending with cream, or on its own. This fresh serum is lightweight, ultra-moisturizing and immediately melts into the skin to restore hydration. With a delicate aquatic fragrance of water lily and tender rose, this true serum has a soft finish for ultimate comfort. 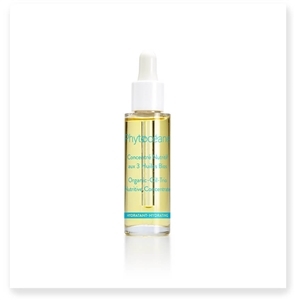 Phytocéane Organic-Trio-Oil Nutritive Concentrate is an extremely nourishing dry oil for dry to dehydrated skin, lacking comfort.